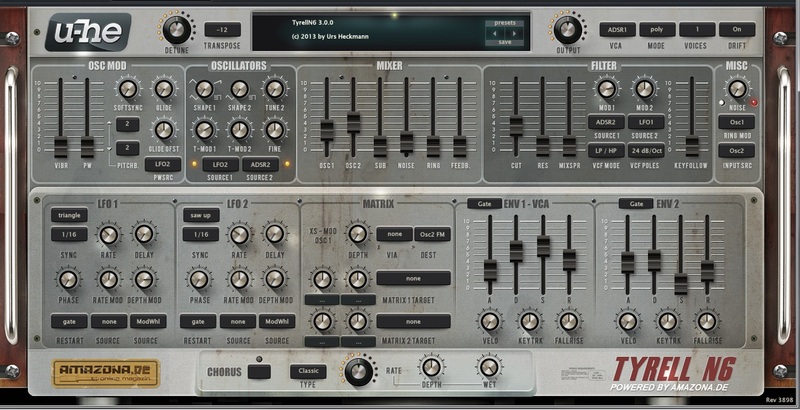 Tyrell N6 is a free virtual synth offered by U-He. Originally, it was the name of a project by Amazona.de, a German magazine. The idea was to create a low-cost hardware synth. However, it would take years until the project was finished, so U-He decided to create a virtual instrument, and offer it for free. Tyrell N6 is a great synth, full of interesting features, in a cool design. 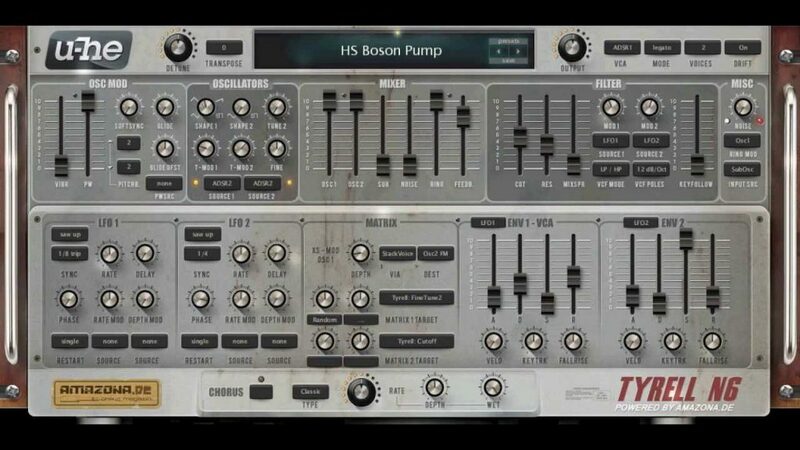 It comes with two oscillators, filter, two LFOs, two ADSR envelopes, oscillator modulation, a mixer section, a matrix section and a chorus fx. At the top, there is the Control Bar. It starts with a Detune Knob and a Transpose button. The detune knob will have different attributes, depending on the number of voices of a patch. Then we have a display, where it’s possible to view the current patch, as well as load and save patches. When the user tweaks a control, the display will show the name of the current parameter and its value. Output button is the instrument’s main volume. There are also options for controlling the synth VCA, the voice mode, voice number and a control for Drift, which will slightly detune a voice, just as analog synths. The Oscillator Modulation has some parameters to modulate the oscillators, such as Vibrato (Vibr) and Pulse Width (PW). It also has controls for Glide and Glide Offset. The PWSRC will allow the user to set the source of pulse width modulation. By the way, you will notice that every section has modulation options. The Oscillators section shows Shape 1 and Shape 2 as the oscillators. There are four waveforms for OSC 1 and two for OSC 2. Tune 2 controls the tunning of oscillator 2, and Fine is a fine tunning for OSC 2. The Filter section also has Source 1 and 2 buttons, where it’s possible to set a modulation source. The Mod 1 and Mod 2 buttons will control the amount of modulation, working with both negative and positive values. The Misc section contains a noise generator and a ring modulator. The Mixer section will control the volume of six parameters: OSC 1 and 2, Sub, Noise, Ring, and Feedback. LFO 1 and 2 have identical functions. It’s possible to choose a waveform, a Sync selector, and it has knobs for Rate, Delay, Phase, Rate Mod and Depth Mod. 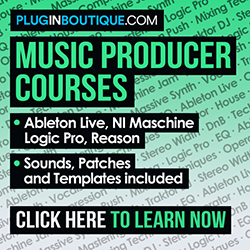 There are modulation sources available for both Rate Mod and Depth Mod. The Matrix section enhances all modulation possibilities, and it allows the user to choose four sources and two targets, as well as a Depth control. Env 1 – VCA and ENV 2 sectors are envelope generators, with ADSR faders, and are used as modulation sources. Env 1 is by default an envelope generator for amplitude, although it can be used to modulate any other parameter. Tyrell N6 also has a dedicated Chorus effect, with an on/off switch, three available chorus types, controls for Rate, Depth, and Wet/Dry signal, and also a volume control. Finally, clicking on the U-He badge at the top will display links for U-he website, social media and also will give access to Tyrell N6 operation manual. Visit U-He website: www.u-he.com to download Tyrell N6.